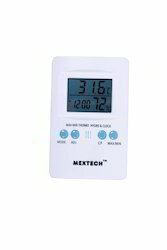 Our clients can avail thermo hygrometers, which are procured from the leading manufacturers and vendors. These vendors have designed and developed these products using quality material. Our products are tested on various parameters to ensure these are at par with the industry standards. These quality products can be bought in bulk at market leading prices. 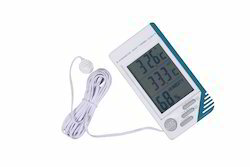 Electronic Thermo Hygrometer IT202 are used, at the price of a lower accuracy. 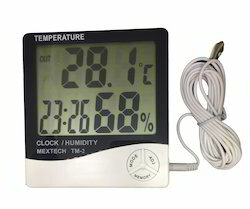 In capacitive hygrometers, the effect of humidity on the dielectric constant of a polymer or metal oxide material is measured. 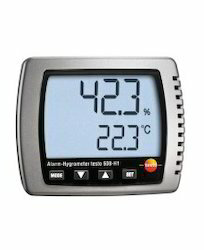 With calibration, these sensors have an accuracy of ±2% RH in the range 5–95% RH. Without calibration, the accuracy is 2 to 3 times worse. Capacitive sensors are robust against effects such as condensation and temporary high temperatures. APPLICATION: Applicable for Refrigeration, Laboratories etc. 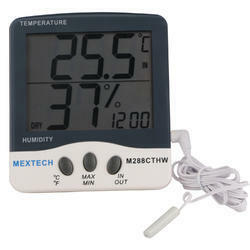 Digital Thermo Hygrometer TM2 is an instrument used for measuring the moisture content in the atmosphere. 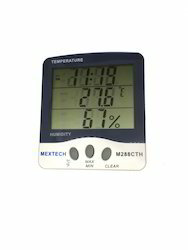 Humidity measurement instruments usually rely on measurements of some other quantity such as temperature, pressure, mass or a mechanical or electrical change in a substance as moisture is absorbed. By calibration and calculation, these measured quantities can lead to a measurement of humidity. 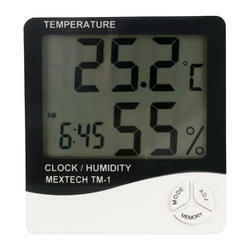 Humidity Range: 15 - 99% R.H.
Sensor types NTC Testo humid. sensor, cap.